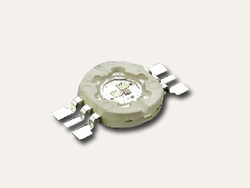 Full color Z-Power LED is the first full color package, using 3 RGB power chips and rendering 7 colors. In case of the full color product used in architectural lighting or decoration, it emits 7 colors in one package so that it can render a clear mixed color when it is mixed with other colors. *1.F50381 is the product with a rectangular PCB.